Nikki Haley Confederate flag speech: How the Charleston attacks forced the GOP to stop pandering. The GOP wanted to keep pandering on the Confederate flag. Why they couldn’t this time. 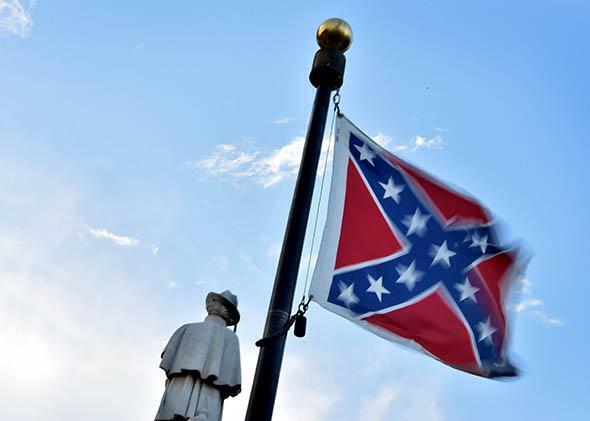 The Confederate flag is seen next to the monument of the victims of the Civil War in Columbia, South Carolina on June 20, 2015. But muddling wasn’t an option this time. Republicans weren’t just responding to the flag, they were responding to a brutal attack on a historic black church in Charleston. The attack, which killed nine people (including a state senator), was motivated by hate and allegedly carried out by a young white supremacist, Dylann Roof, who wanted to spark a “race war” against black Americans. No, Roof wasn’t inspired to commit his crime by the Confederate flag, but in photos posted online he clearly used the imagery in its original meaning—as a symbol of anti-black animus and racial subjugation. In response to the attack, a bevy of activists—and ordinary South Carolinians—called on the state to remove the flag from the capitol. “The flag has to come down,” said Cornell Brooks, president of the NAACP. Removing the flag won’t be easy. Rules limit an upcoming extended session of the General Assembly to just a few concerns—to add the flag to the agenda takes a two-thirds vote of the entire legislature. But with Graham and Scott behind Haley, the statewide GOP establishment seems to support to change. And Haley has pledged to take more direct action if the legislature doesn’t move quickly. There’s no doubt that Roof was on the fringe of life in South Carolina. But Haley can’t change the fact of the flag’s actual heritage: The Confederacy was a project for the preservation and expansion of slavery, and the Confederate battle flag owes more to the struggle against integration and civil rights than it does to some nebulous—and effectively whites-only—Southern heritage. Indeed, this particular notion of “heritage” is tied to the anti-Reconstruction historiography of the late 19th century, where white supremacists extolled Confederate valor and painted an antebellum portrait of gentle masters and contented slaves. Racism is central to Confederate iconography in the same way that slavery is central to the Civil War, constant protests notwithstanding. Of course, Haley isn’t a historian; she’s a politician. And a press conference isn’t the place to contest the deep-rooted views of her constituents. What’s important is that she wants to remove the flag, and while it’s tempting to wonder if she’s sincere—she’s made a complete turnaround from her position last year—it’s also true that, in politics, sincerity isn’t as important as results. What counts is getting it right, and on this issue, Haley has succeeded. As for the Republican presidential candidates, they now have an out. When anyone asks what they think of the Confederate flag, they can just point to Haley and say, I agree with her. By Monday evening, they had already begun to do that. Read more of Slate’s coverage of the Charleston shooting and of the 2016 presidential campaign.